Do you have a website that's related to horse racing, harness racing, greyhound racing or jai-alai? Would you like to infinitely earn from 25% to up to 40% commission for every player you refer? Then start earning affiliate commission from one of the world's most recognized horse racing sites. 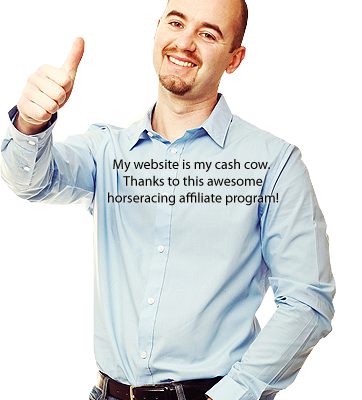 Our Horse Racing Affiliate Program is your best choice to earn unlimited cash from your website. It is user-friendly, safe and secure which ensures a delightful customer experience which will result in countless repeat visits. This will in turn mean more commissions for you as we'll pay you indefinitely for your referrals' betting activities. Join now to start your perpetual cash flow. Place our partner website's banners or links on your web site. Your site visitors click on these links, sign-up and bet at our partner site. You earn 25% to 40% of net revenues we derive from members you've referred to our partner website - for life! You'll receive your monthly earnings via check, Money Bookers, or NETeller by every 20th of each month for the previous months activity. You can also check your Affiliate Statistics in real time by visiting our Affiliate Statistics Area. And to make it more easier for you to market your site, we'll handle everything for you! From creating effective links to sending out your monthly payment, we'll take charge so that you can focus your time and effort on developing and marketing your website. The more effort you put into these tasks, the more $$$ you can make!